The Channel Men’s Shed runs a very successful program in conjunction with the Kingston LINC Boat Project as per a request we received from Allyson Ekin of Kingston LINC (KL). KL obtained funds from the 26Ten organisation and apart from the utilisation of the Shed facilities the project is aimed at improving the literacy and numeracy skills of participants. The first boat project was owned by a Shed member, Adrian Dean, who mentored the boat refurbishment with the occasional assistance of a TasTAFE teacher. Tim Oxley (a Committee Member) has overseen the project and acted as the Shed’s representative. The Shed has provided practical assistance as required. Phase two of the project has been mentored by David Heard, one of the mentors from the Men’s Shed who helped teach six trainees how to build the boat, while also helping them to develop their literacy and numeracy skills. The boat was built at the Channel Men’s Shed at Margate and is 11 feet, or 3.3 metres, long. It was auctioned as part of the 2015 Wooden Boat Festival in Hobart. Because of David’s own background and personal experience as being dyslexic, he is well qualified in terms of approaching the problems that present to participants in the program who do not necessarily have good reading and writing skills. He is pretty sensitive to sort of sidling up to the issues that could be problematic for them. The boat is built totally of recycled materials. 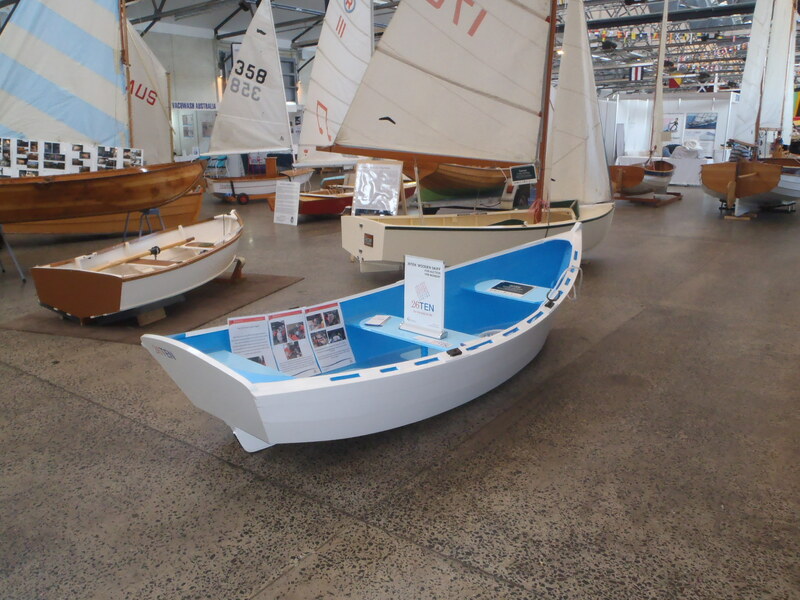 People might be surprised to think that a plywood boat could be built of recycled materials, because after all plywood is a manufactured product, but you may remember there was a big flood in Brisbane and a lot of materials washed out of warehouses down the Brisbane river and out into the bay. The plywood used for these boats was actually picked out of the sea water, so to that extent it was recycled. Learning about literacy and numeracy is built into the process of building the boats because the drawings and notes need to be understood by the students to comprehend what part of the boat they’re building,. They have to understand where they can lift the design off the drawing and how to convert it into a piece of wood that’s the right shape to make that part of the boat. Trainees’ literacy and numeracy skills improved as the boat took shape and there were several examples of questions that came up which were answered by looking at the drawings which made it very clear that their understanding had greatly improved.